Staniforth cites this section, as Marcus references it in Chapter 30. However, the Roman Satirist may seem to be incorrect in regards to man’s social nature at first brush, right? They Cynics are known misanthropes! However, I think we’ll see a bit more similarity than might at first be apparent. As I mentioned previous, I’ve been reading a good bit from Navia on Diogenes of Sinope and classical Cynicism. One of the claims we see about the Hellenistic Cynics, and their paragon even more so, is what can appear to be a hatred of humanity. Diogenes’ constant haranguing of the people, his disregard for social obligation, his lewd gestures and action all might lead us to suspect that The Dog hated people. But this is the shallowest of readings. If Diogenes had hated humanity, why would he have spent his entire philosophical life among them, providing an example in extremis of what was sufficient for virtue? Why would he search for an honest, or true human? Why would he try to make them better than they were, and better even than they saw themselves? The only reason that makes even the slightest bit of sense to me is because he loved them. He loved people. We find ourselves more frustrated and caught up in the happenings of our family and friends than we do the passerby, or random story on the news. Why? Because we love these, and thus their faults, misgivings, and suffering is the more poignant to us. I suspect the same is true for Diogenes. Marcus constantly reminds himself, in essence, to love and to act out that love for others. To accept the role the cosmos has ordained, and to educated or put up with those who fail. Ironically, Diogenes must have already achieved this love, albeit expressed in a … strange fashion. The Cynic, then, instead of being an asocial hermit finds herself in the thick of it as much as a Stoic! She’s trying for many of the same social benefits. The difference then comes down to the doctrine of indifferent things, which the Stoics espouse and the Cynics deny. Despite Juvenal’s tongue being planted firmly in cheek, it’s actually a pithy distillation of a doctrinal difference, but what’s more the point is all of the other similarities. So, whether or not you’re shirtless, this obligation to social activity is just as important. This post is part of Michel Daw’s Reading Plan of Marcus’Meditations. Whew, there’s quite the spread of topics here. We’ll stick to one topic: the beautiful, ὁ κάλως. This word can often be interchangeably translated as “good” or “beautiful.” Marcus is stating the position that beauty (read: goodness) is intrinsic, and nothing is made better or worse by praise. This seems to be the rougher side of the coin to what Marcus is reminding himself. 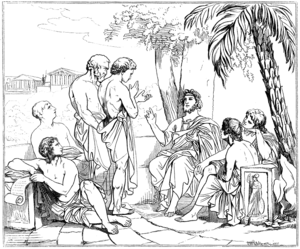 Most folks see the teachings of Epictetus echoed in Marcus, but just as the figure cut by Diogenes is an almost hyperbolic example of Socratic teaching: Marcus often seems to be the applied version of the more “extreme” Epictetan example. It continues to impress me how these folks 2,000 years separate from us have such a keen understanding of human nature. Of course we will seem different from the average when we’re seeking to right ourselves. Of course that will be a hard pressure to resist. Of course that will elicit both scorn at the outset and potentially after a time admiration as well. Of course we must prepare ourselves for both of these impressions. We do this by building in ourselves the skill of judicious discrimination of impressions. Whether it is praise or scorn, if the feedback does not relay accurate moral information to us, it is nothing. So set aside the beauty of the horse, the scorn of the passerby, and the fawning praise of others: because we’ve got work to do. Work on ourselves, work for the good. If you’ve found some value in the posts here, I humbly request you consider supporting the blog on Patreon. Thank you for your readership. One of the things Marcus discusses today is a term which we inherit from Diogenes of Sinope, cosmopolitanism. During his lifetime, citizenship in a city was a defining characteristic for Hellenes, in much the same way as nation-states are today. When asked where his allegiance lay, he responded that he was a citizen of the world. A bold assertion then and now. The Stoics inherited this doctrine from the Cynics, and Marcus uses it to remind himself that all rational creatures share in the logos. That men do evil not of their own accord but through ignorance, and that he must work with his fellows without regard for honor or reputation. He gives himself reminders that he can, at any time, retreat into himself, and take shelter from the world should he need it. That he doesn’t need to actually flee from this problems of life. He notes that if his ruling faculty is in accord with nature, even these problems become of the fodder for progress. A group I recently was exposed to by a follower of the blog and Patron is Stoics In Action. They are trying to apply Stoicism to modern problems, there is even a recent post on cosmopolitanism. I noted earlier this week, that it is a non-trivial problem to apply Stoicism in a way which doesn’t simply use it to prop up preexisting political commitments. I hope they’re successful. One of the models we get from the classics comes from Hierocles, and deals with the doctrine of Affinity/Familiarity, or in the Greek οἰκείωσις. This process involves imagining that there are concentric circles of affinity, with each individual at the center. We have self, then family, then townsfolk, then countrymen, then foreigners, then all rational beings. The process of οἰκείωσις is to treat each of these groups as if they are at least one circle closer to us. So the benefit of the family is treated as our own benefit, and at the far end, all people are treated as if they are our fellow citizens and countrymen. It’s a useful, quick-and-dirty model for helping to shape and think about ethical behavior. You can see that the Stoics In Action folks have used this for their logo, which seems to me to be appropriate. If this kind of project interests you, swing by and see what they’re doing. One of the things that came across to me today in the readings is the urgency Marcus feels for progress. I understand that on a deep level. It is both motivating and slightly disturbing to add up the years which have gone by, and compare them to the likely number ahead (knowing these aren’t guaranteed in the slightest). I’m reminded of this for two reasons, one being that the Stoics denied intermediary states between virtue and vice, thus the depth of the water to the man is in irrelevant: he’s drowning regardless. But also in a way I don’t think I’ve seen anyone express before. I’m not sure if this is a game children play everywhere, so this may not be as widely understood as I hope. I’ll try to be particularly descriptive just in case. Here in Appalachia we have a good many underground tunnels on interstates and highways, some of them quite long. There’s a decent sized one, for instance, coming into Pittsburgh PA on 376, The Fort Pitt Tunnel. 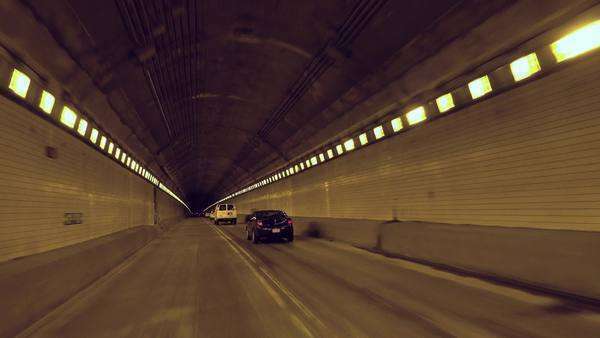 As a kid, and if I’m honest often as an adult, we’d play a game to see who could hold their breath for the entirety of the tunnel as passengers in the car. The mind knows it can breath at any time, you just have to give up and lose. You also know that you’re not really in any danger. Nevertheless, about 2/3 of the way through, an existential panic creeps in. The muscles around the ribs burn with the effort of stillness. A pressure builds in the head. You can trick this a little by exhaling slightly, in little controlled puffs and not inhaling. Tricking the system into thinking it’s breathing again. But this only buys you an extra couple of seconds. If you’re here, you’re already close to your breaking point. If you can’t make out features at the end of the tunnel, and you’re puffing out, you’re not going to make it. The need to breathe, the fear of suffocation is an ingrained and deep sort of response. For those who are more than dabbling in philosophy, I think the urgency that is felt is akin to this: we see that we’re drowning, we know it. We also know, like the children in the tunnel, that failure or success is up to us. That drive towards progress, then that Marcus notes, has something much closer to the experience of the actively drowning man than the conclusion might promise, in either direction. It’s that edge-of-panic need to ease the problem. In my experience, once a certain difficult-to-articulate-amount of progress has been achieved, even this desire for progress itself is tampered. But, backsliding is always possible. So possible. In my own experience, this is extremely accurate. In some ways, the backslide feels like you’re even worse off than when you began. Typically, the drowning metaphor of Cicero is seen as depressing, it is about drowning, afterall. Whether you’re an inch away from the surface or 100 feet down doesn’t matter, drowned is drowned. That might be depressing if you’re the one who’s an inch down. But if you’re 100 feet down, it’s less so. In fact it may even be empowering. Progress is progress, and there’s one way direction to go. We have two topics again today, one is on the nature of life and perception, and the other on the work of our ruling faculty with a touch of Providence. I’m going to only focus on one of these today: the ἡγεμονικόν or προαίρεσις. But first, a seeming diversion which in fact gets us to the point. One of the great treasures of the modern Stoicism movement is Franco Scalenghe. Franco runs Epitteto.com. In addition to a new, modern translation of all of Epictetus works (an immense undertaking) which he offers to the reader without cost (! ), he has written five dialogues. These are dialogues in the classical, philosophical sense. In these, one of the things discussed is some new work in the field of Epictetus. We have many folks working on Stoicism, and a few novel inventions, but this seems to me to be the most in line with the classical texts while making some valuable movement in it. 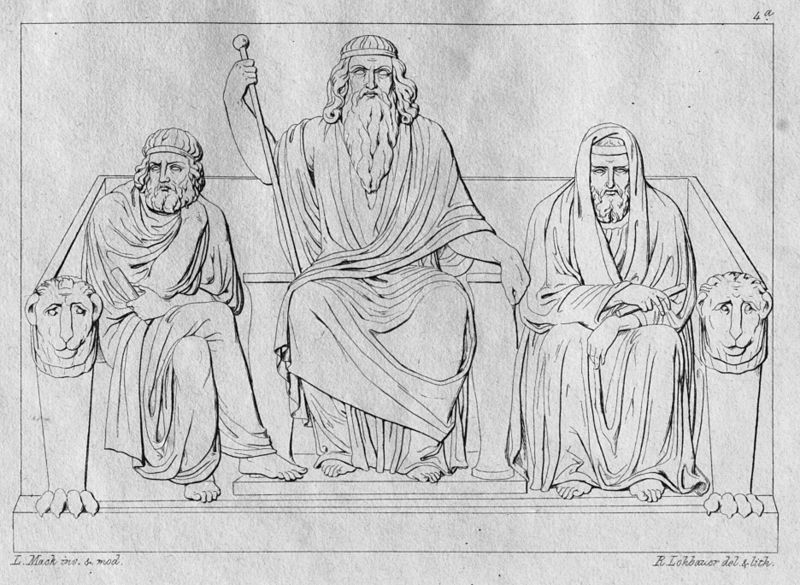 Franco breaks down the ruling faculty of the mind into three functions, or judges: The Diairesis, the Antidiairesis, and the Counterdiairesis. Franco does an excellent job translating into English, and he has chosen to leave a handful of words in the Greek which may cause confusion in translation. Do not get hung up in the new terminology, the Dialogue makes it clear what’s being discussed. This brings us to the meat of the issue: the ruling faculty, or prohairesis. Without stealing Franco’s thunder, or misrepresenting anything: the tasks of the various judges are to identify what is up to us and not up to us and to formulate projects in either case. It is the purview of the Diaresis to discriminate between what’s up to us and not, and to formulate projects that are entire up to us in the Epictetan sense; and the Antidiaresis’ is to formulate projects in the other case (i.e. externals) based on the judgement of the former one. When the prohairesis refuses or deludes itself into believing that something which is up to us in fact isn’t, this obfuscation is called Counterdiairesis. An additional trouble arises because Counterdiairesis can also give orders to the Antidiairesis, and thus we forumlate projects incorrectly and are twarted. If all of that is a bit much, it is merely a one paragraph survey of about 40 pages of Dialogue, but if this idea interests you, I would point you to Franco’s site where you can read the dialogues in several languages, as well as his other works. Franco’s categorization is a very good model for how our ruling faculty works, in my opinion. The added benefit as I see it to the standard formulation is that it gives us three places to look for errors in judgment. We can play a “what if” game, and find out where things may have gone wrong, and maybe then we can fix them. The Dichotomy of Control gives us a powerful tool, but it can often be difficult to identify in which category a given impression or project is rightfully placed. The incorrect solution to this problem is the Trichotomy, but Franco’s model offers (to my mind) the better option. Marcus notes a few points which tie into this: the first being that our ability to form opinions is paramount (this is a work of the Diairesis in the above framework), and by it alone can you avoid committing errors by making plans contrary to the nature of things (a project ordered by Counterdiaresis). Franco and Epictetus agree that the prohairesis is the closes thing to a “self” which can be identified, the judge that sits and rules inside the mind/soul. This three-part model is an interesting one, and I recommend it to your study. After you’ve spent some time with Franco’s Dialogues (and I do suggest more than a cursory reading, there is a lot there to ruminate on), I’d be interested in your thoughts and if you think this is a model you would adopt for your own way of thinking about prohairesis and the hegemonikon. Marcus is discussing the value of virtue today. A few things pop out that are worthy of note. It can be difficult to tease apart a text and separate what might be personal influence from a wider cultural trend. When Stoicism ceased to be a strictly Hellenic pursuit, and was take up in large part by the Romans, it had some of the rough edges knocked off, and was draped in Roman decorum. This was a novel addition. 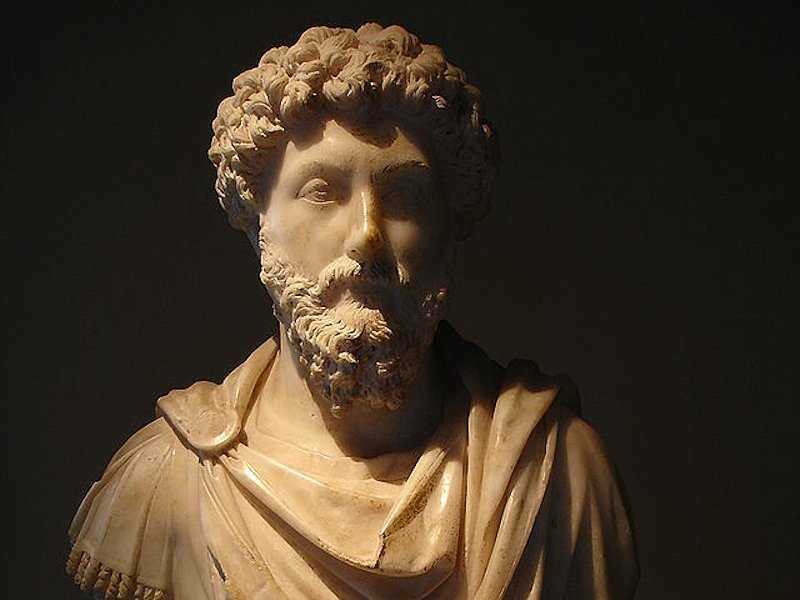 Just as the Stoicism that is practiced around the world today looks somewhat different from its iterations before, so did the Roman from the Greek. Marcus’ first chapter is an homage to Roman decorum, and we can detect the importance of this to him. I often see folks ask why virtue is the only good, and my answer is two-pronged. Firstly, that virtue is a good is an axiom, it is taken as self-evident and not generally subject to direct argument. Second, we can argue that externals are not good, such as one man may use wealth virtuously, and another viciously. So we cannot then say that wealth is a good if it may be used viciously. We do get explanations, as in Epictetus, that virtue is “up to us” therefore a proper avenue for our efforts, but these are sort of ancillary to the point. Marcus’ offer here speaks to that: if you find anything better, then you must turn towards that object, and if you cannot you must work towards moral progress with everything you have. The rest of this chapter are expansions on this idea. I don’t want to infer incorrectly what it might mean that Marcus spends the time he does on this issue, but I know for me it is the case that sometimes more than others the idea of virtue in and of itself is more or less motivating. In the times when it is less so, I find this section helpful and comforting. Marcus closes this piece with an admonition against “the ends justify the means” types of reasoning. Many indifferent things which we might prefer can be acquired in unsavory ways. It is a clear danger to begin down the road of enjoying the benefits of (even other folks’) vicious projects. This becomes difficult when run out to its logical conclusion, and I suspect the moral courage to stand in the face of this is an uncommon trait. Say for instance you are a citizen of a country called Pineland, or the employee of Mega Corp, or any other similar situation. You discover that the organization you’re affiliated with does some awful things in the service of the betterment of its people. Marcus’ main injunction is not to value the benefits you might receive as a result, but is that good enough? Do we instead have an obligation not to receive them at all? We might fall back on a distinction between what’s up to and not up to us, but that doesn’t seem to resolve the conflict satisfactorily to me. Marcus seems to have resolved it for himself, however. As the closing lines of this chapter speak to keeping care of the δαίμων inside. Either way, some decided food for thought. How do such ethical obligations extend to our activities in the polis? Should they at all? How far do those obligations go? Is it appropriate to use the polis to shape the moral discussion of others, to compel if not their thoughts (although there are some who do aim at this) at least their deeds? A modern Stoic political theory is something which would be interesting to read. I’m not yet ready to write anything firmly in this topic, as I suspect I would be too inclined to use Stoicism to support my political commitments. From what I’ve read of others, this is true of them too. Hopefully soon, we’ll have enough folks with enough progress under their belts to begin to discuss Stoic politics qua Stoics, and not as some other -ist or -ism. Part of Michel Daw’s Reading Plan of Marcus’Meditations. We have two topics today, both dealing with speculation and the color of our thoughts. In the first, Marcus lists some of the paragons of the mind on classical antiquity: Hippocrates, Heraclitus, et al. Despite how these contributed to the social weal, they passed away. There’s a tinge of irony here, in some of these deaths as well: the manner or context of their dying contrasted with the focus of their study, or speculation. Marcus is using this a meditation on death and on meaning. We might spend a significant portion of our time speculating on (for his concern and ours) virtue, yet the sand continues to trickle through the hour glass, and we have no idea how much is left. Heraclitus’ work has only come down to us as a series of fragments, and indirectly as the underpinning for Stoic physics. If you are not familiar with these, I would recommend them to you. It’s a refreshing change pace, and for me personally seems to speak to the parts of the mind that respond to symbol and allegory. It has a sort of Zen or Daoist feel to it which I can appreciate. The second topic today is a bit more practical, and speaks to the quality of our own thoughts. Impressions are presented to the mind’s ruling faculty without effort or control. How we handle those, however, is within our control. This recurring theme in Stoic practice: internal dialogue, is how we process and handle our internal environment. The phrase “a rich internal life” is often used, and this is one window into that. Most of the time, if I’m not consciously working on monitoring my thoughts, the internal dialogue seems to go of its own volition, like a program, running through subroutines and programs that I’ve encoded through decades of judgments. We must remember, however, that our emotions are (either) the result of judgments or judgments themselves. I’m inclined to the former interpretation. So monitoring this stream, and making changes there, is incredibly important. Eking out the tiny bit of time between an impression and the result of a faulty judgment is difficult, but it’s way easier in my opinion than correcting a false assent and turning that emotion around. Marcus is discussing this, albeit from the other end, focusing on what the end should be. The test he implements is, “if anyone were to ask what we are thinking, that we could respond immediately and honestly.” This is interesting. I suspect many people, myself included, would not always pass this test well. Epictetus, and thus we can assume Marcus, thought very highly of (true) Cynics, even going so far as to hold Diogenes of Sinope up as a possible example of a Sage. 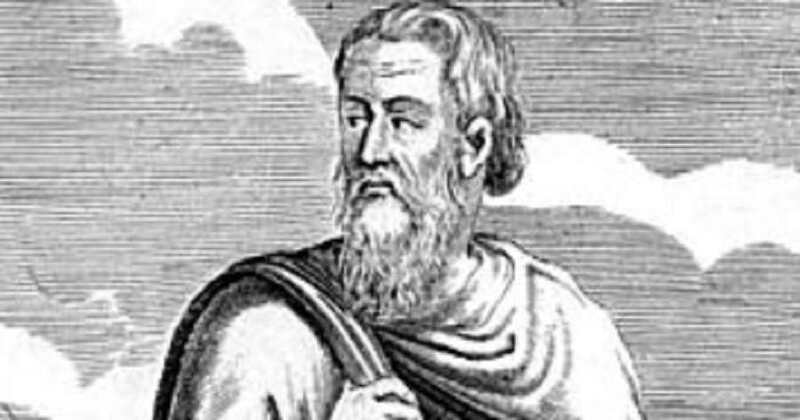 Cynicism is the motherschool to Stoicism: Zeno of Citium studied under Crates the Cynic (amongst others), who studied under Diogenes. Diogenes is likely to have studied under Antisthenes (this is debated somewhat), who was a direct associate of Socrates. So not only do we get many of the core tenets and practices, but our Socratic lineage as well comes via the Dog. Lately, I’ve been reading a good bit on classical Cynicism, I have to books from Luis Navia sitting on my desk here right now. One of the core positions of Cynicism, which Stoicism inherited in some form, we can see repeated in Marcus’ test above. One of the traits (we may go even so far as to say virtues) of the Cynic is shamelessness or ἀναίδεια in the Greek. Although Diogenes was held in relatively high esteem by the early Christian church, they drew a line here, generally, and didn’t think overly well of the practice. Diogenes’ line of reasoning is, that anything which is in accordance with nature cannot be evil (the Stoics would agree), and anything which isn’t evil has no need to be hidden. Ah, we see here the seeds of Marcus’ reasoning then, too! To return to what is shameful, It is interesting that we intuitively know what things we do (or would) hide away. You can see toddler will hide, lie, and do other things which are to their advantage. Yet they show no concern for their body functions, modes of dress or eating, etc. They do not hide what is natural, but are very quick to learn to hide what may be immoral. As adults, some of what we cloister away is for modesty’s sake or social expectations for our time and place (not a concern for a Diogenes), but others for rightfully acquired shame. It’s this second class that we can work on, and it’s this which Marcus is setting up for himself. We can take the Cynic ἀναίδεια in a Stoic fashion. We can change or remove those behaviors and thoughts that would lead to a rightful feeling of shame, correct them before they work their way out into speech and deed. Which of our thoughts would rightfully feel shameful about? These are the things to work on. This then is a lesson from the Tub that Marcus and we can benefit from. 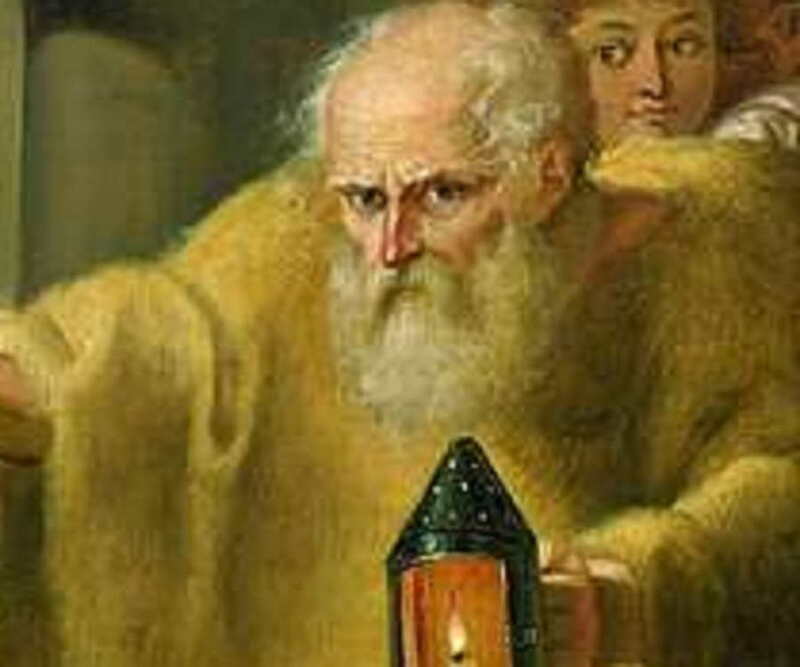 Maybe we can work on being the true or honest person Diogenes looks for with his lamp?